The SW England & Cornwall District of the Communist Party of Britain held its congress in Exeter on Sunday 19 November. In a hall decked with the banners of the District and its branches, the delegates heard a report of work for the past two years and elected a new District Committee of eight members (three women and five men). Delegates stood in memory of comrades Ron Champion, Theresa Barry and Cyril Smith who had died since the last congress and tributes were paid to them. The congress resolved to place more emphasis on political education, appointing a new officer to organise this, and passed a strong resolution on Cornwall. This noted that Cornwall is poorer than any county in England, with wages the lowest in Britain and low wages, poverty and lack of prospects for a decent life driving the younger generation away. The picture is all the more stark, it went on, when set against that of wealthy visitors who treat Cornwall as a beautiful playground, oblivious of the poverty in their midst. It welcomed the establishment of a trades union council in Cornwall. Praising the work of the Cornwall Branch, the congress resolved to prioritise support for it and to raise the problems of Cornwall at every possible level. Owain Holland, General secretary of the Young Communist League, spoke about the World Festival of Youth and Students which he had attended in Sochi, Russia, and thanked the District for its financial help in making it possible for him to go. He said that the Russian government had interfered with the festival by issuing invitations without the authority of the organisers, the World Federation of Democratic Youth. Nevertheless, the festival had been a great demonstration of international solidarity against imperialism and for world peace and an exciting and unforgettable experience for all who took part. Rob Griffiths, General Secretary of the CPB, addressed the congress, giving updates on the current political situation, especially concerning the good prospect of a Labour government and stressing that a socialist Britain is impossible without a strong Communist Party. We put the full-bloodied case for socialism, he said, which the Labour Party never does. Bringing warm comradely greetings from the Party’s Executive Committee, he said that the response to the celebrations of the centenary of the Russian revolution had far exceeded the EC’s expectations. Rob Griffiths stressed the need to explain our distinctive position on Brexit, to explain to progressive people the real character of the EU as a monopoly capitalist alliance of the main imperialist powers in Europe. He said that the aim of most business groups is to thwart the referendum result by creating an outcome that would be as close as possible to the substance of EU membership. The General Secretary asked for strong backing for the Party’s financial appeal for £19,170 which was not launched to meet everyday costs but to run a recruitment campaign, to help build the Young Communist League, to pay for a new high-quality EC banner and to buy new technology including the ability to make laser billboard projections. He drew attention to the local elections on 3 April 2018 and pointed out the need to celebrate, in 2018, the 200th anniversary of Karl Marx’s birth (5 May 1818). The new District Committee, meeting immediately after the congress, elected officers, re-electing Liz Payne as Chair and Ken Keable as Secretary. 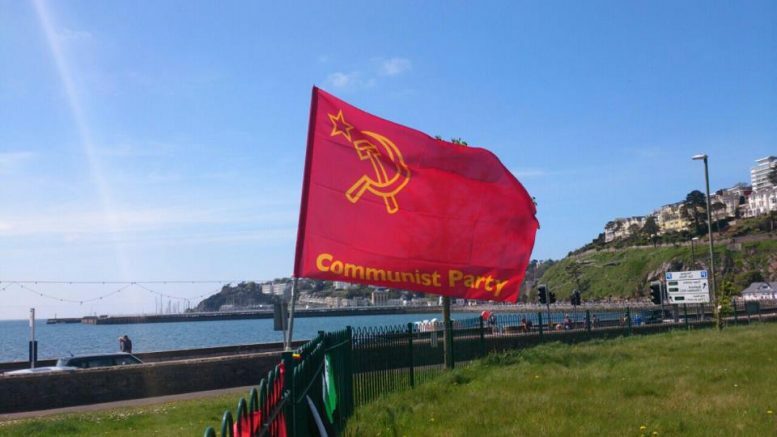 Be the first to comment on "The SW England & Cornwall District of the Communist Party of Britain held its congress in Exeter on Sunday 19 November."